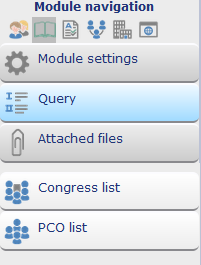 In the abstract module the PCO has also the possibility to check the registrations for the abstracts. It works a almost the same as the conference participant registration. Click on Authors to see all information about the Authors of the abstracts. In the author query the PCO can find the username password and the address of the author. The PCO can also see if the author has submit his/her abstract.